A cool app for facebook fans. 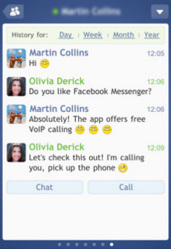 You like Facebook chat on Your IOS device. If your answer is yes, than you are looking at the right application. Made by Crisp App, this new amazing application “Fone”, enables you to call your Facebook friends, using a VoIP protocol with your iPod touch and Iphone. You can shoot pictures, browse message history, view friend’s wall, add emotions to your text and receive instant replies with Apple Push Notifications and setup sounds notification. It’s a fun application; this application isn’t affliated with Facebook but is worth mentioning. With Itunes, it comes in two versions, one is free, but you can purchase more feature with just 0.99$.